It’s no secret that creating cute crochet tops is what I’ve been into this spring. When I was trying one of my finished tops on to show a friend she remarked that I could only wear it because I have a small chest. So I set out on a mission to prove her wrong! 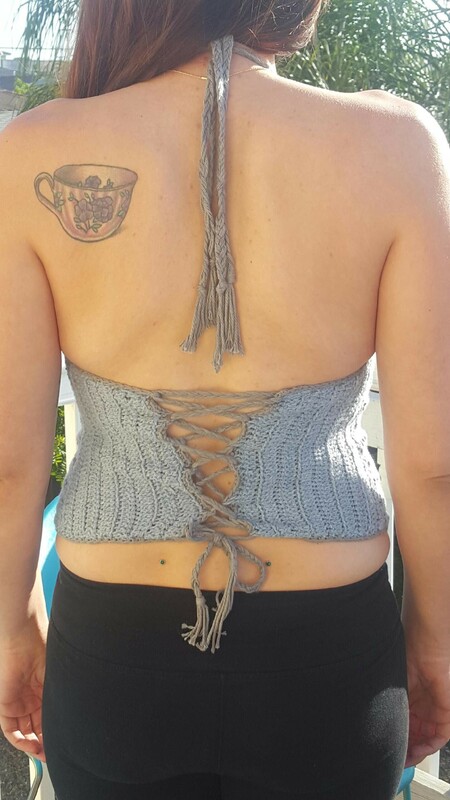 I made her a crochet top with cups that fit her DD cup size breasts. I included an extra tight row of single crochets underneath the cups for extra support. I also made sure the straps were thick and secure in order to give her plenty of lift! Finally, I included the corset back so she can pull as tight as she needs for support from the bottom. Also for those of you who sew, it’s extremely easy to hand sew padded cups into the inside of your breast cups. I normally use padding that has lost its way from an old bathing suit or bra. Needless to say she has eaten her words and she loves the end product! I’m sharing this pattern for all the other girls who thought they couldn’t wear something because of their size! Enjoy and if you want to keep up with my work, join Crocheting Creatively on Facebook! Materials — Sugar’n Cream Cotton Yarn 3 Skeins. This pattern is for the top seen in the photo. The breast cups are for a size DD, and the rest of the shirt follows a medium pattern. If you are making the pattern for a size smaller than a DD cup, simply do not add as many row to each cup. Turn work and SC until the last stitch. In the last stitch 3 SC. Continue crocheting down the other side of your work until you reach the end. Ch one and single crochet until you reach the middle stitch of the 3 SC (the 11th stitch at the very top of your work). 3 SC in the 11th stitch. Continue single crocheting down the other side of your work until you reach the end. Repeat 17 times (or until cup is desired size). Tie off your work and cut. Repeat the above pattern for the second cup. Join the cups at the bottom creating your own spaces to insert single crochets. Do not skimp on SC or your work will tighten and start to buckle. Ch 1 and SC until the end of the row. Ch 1 and HDC until the end of your row. Ch 2 and DC until the end of the row. Repeat 8 times (or until desired length for top). Insert your hook into the side of the shirt at the bottom in the last stitch. Create spaces and make SC until you reach the beginning of the body of the shirt/bottom of the cup. Ch 2 and DC until the end of the row. Repeat 8 times. Repeat above pattern on the other side of your work. Create a border of SC around the edge of your work. I chose to use another color, but it’s your preference. Start in the bottom corner of one of the sides and SC around your shirt. When you get to the starting place, join with a SS. Cut 6 pieces of equal length yarn (about 2 feet) and tie in a knot with about 2 inches of loose yarn at the end. Braid in sections of two until you reach about 2 inches of loose yarn at the other end and tie in knot. Fold the braided yarn in half. Pull the braid yarn at the fold through the top of your breast cup. Put the two loose ends through that loop and pull tight. Cut 6 pieces of equal length yarn (about 3 feet) and tie in a knot with about 2 inches of loose yarn at the end. Braid in sections of two until you reach about 2 inches of loose yarn at the other end and tie in a knot. Pull the braided yarn through the top corner of the right side piece. Then pull the other end through the top corner of the left side piece. Pull the braided yarn through so that the piece on the left and right are equal length. Use your hook to create a space 1 inch below your starting point on the right side. Pull the piece of yarn from the left side through that space. Use your hook to create a space 1 inch below your starting point on the left side. Pull the piece of yarn from the right side through that space. Repeat this pattern until you’ve reached the bottom corners on the left and right side. This creates a corset back for your work. Sew in all your loose ends and it’s ready to wear! @SDSU Alum, Crocheting Creatively Founder, Social Media Coordinator @NautilusFitness. The best accessory is confidence.